When I was a kid, one of my favorite activities was sitting with my grandfather in front of huge bags of green beans that he had picked from the local U-pick farm and snapping the ends off of them. My grandfather loved to gnaw on the raw beans and chat away with me. This year, Kenya and Chloe planted their first bean stalk and when the beans were finally ready, the two of them had the best time picking them, snapping the ends off and helping me steam them for dinner. Fresh green beans are crisp, sweet and delicious, but after a summer full of simple preparation I decided to test drive this version. My kids love almost any food with a crispy crust, so I should have known what a big hit it would be. Because the beans are baked, they have the crunchy coating of fried beans, but are totally healthy. But the real star of this dish was the ginger-honey mustard dipping sauce. Chloe was busy dipping and dunking her veggies in it (and when she ran out of beans she even tried to drink it!). Whenever you want to change things up a bit and put a spin on what seems like the everyday ho-hum veggie, try this and see how your troops react. 1. Preheat oven to 450 degrees and coat a large baking sheet with cooking spray. 2. Mix the first 3 ingredients in a bowl. 3. Whisk the egg in a separate bowl. 4. Place the flour in another bowl. 5. Make an assembly line with the three bowls, first dipping the green beans into the flour, then the egg and finally into the bread crumb mixture, coating the beans evenly and repeating with the remainder of the beans. 6. 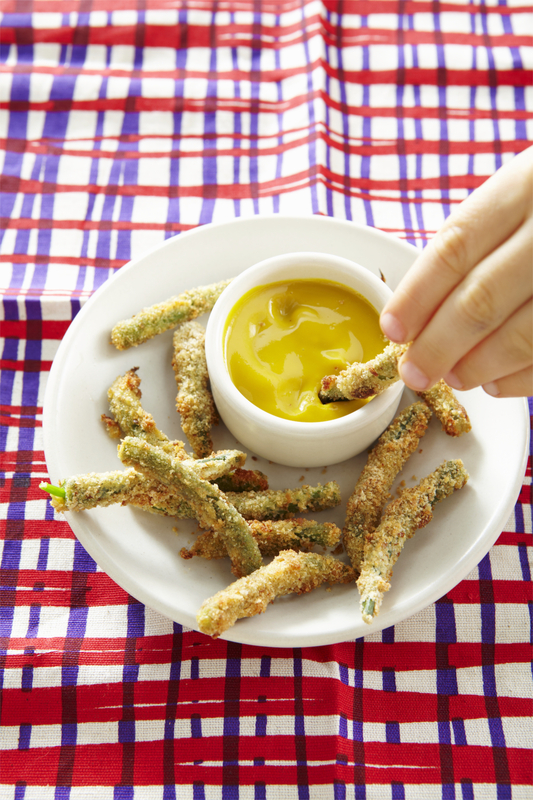 Place all of the coated green beans on the baking sheet or on a rack above a baking sheet. Arrange beans so that they’re not touching, spray with oil and bake for 30 minutes or until the bread crumbs are golden. To make the dipping sauce: combine ingredients in a bowl and stir to combine well. * If freezing, after step 5 place on a baking sheet and freeze for 30 minutes. Remove and place in a Ziploc bag, label with the date and name of the recipe, and freeze. When you’re ready to eat – take them out of the freezer and put them in the oven, adding at least another 3-5 minutes to the baking time. Yay! I've been looking forward to these! What makes the dipping sauce \"ginger\" honey-mustard the only ingredients I saw listed were honey and mustard. Are you also adding crushed ginger? How much? Sorry for the typo, there is no ginger in the dip. What can I use to substitue for eggs? My son is allergic to eggs. Thanks! You can use buttermilk if your son doesn't have a dairy allergy. Or, since mine has both an egg and dairy allergy, I use plain soy milk. It won't be quite the same, but it works! As we are moving into winter, and fresh veggies are not available, would canned green beans work? They might, you would have to pat them dry and dip them into the flour, egg and breadcrumbs and bake. But they will come out a little over done so i would cut down on the cooking time till they are golden. Thanks so much, my husband and I are trying to find new ways to cook veggies since our son refuses to eat most veggies! I think the dipping sauce might make him more interested and the breading will be a nice change in taste! 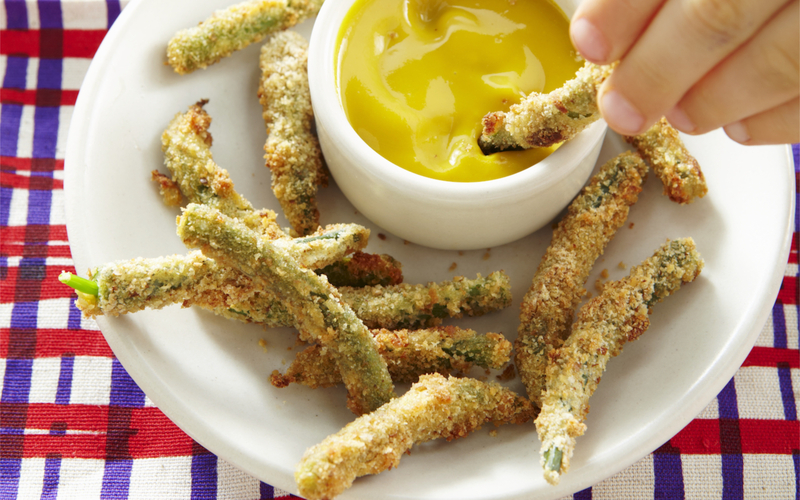 I have a million green beans from our CSA, so we'll definitely make this recipe! Great idea! did you mean 350 degrees instead of 450? i tried these yesterday and i had to take them out 10 min early and they were already burnt. Every oven is different, try doing them at 425. I used yellow beans too in this and they work great! I love the ideas for the egg substitue! My 3 year old son has an egg and wheat allergy. Any ideas? Anyone tried these with flash frozen green beans? I picked up some amazing organic frozen beans as it's hard to find fresh organic beans now that it's late fall. These are so delicious and my 1.5 year old ate them up. For the dip, I used maple syrup instead of honey and it was tasty. I recently discovered your blog/website as I was searching for ways to get my 2.5 yo to eat more vegetables and other healthy options and this was one of the first recipes I tried. It has been a hit with my 2.5 yo, even though she tells us she hates green beans! Can I use frozen green beans for this recipe? No, the frozen green beans will be too mushy. :( Fresh is the best for this one! Where did you pick up whole wheat Panko crumbs?